Comfortable sleepwear basics. Pretty sleepshirt crafted in a soft and stretch jersey fabrication. Printed trim along the neckline, chest pockets, and hem. Round neckline. Short sleeves. Left chest pocket. Shirttail hemline. 95 percent rayon, 5 percent spandex. Machine wash cold and tumble dry low. Imported. Measurements: Length: 33 in Product measurements were taken using size SM. Please note that measurements may vary by size. Comfortable sleepwear basics. 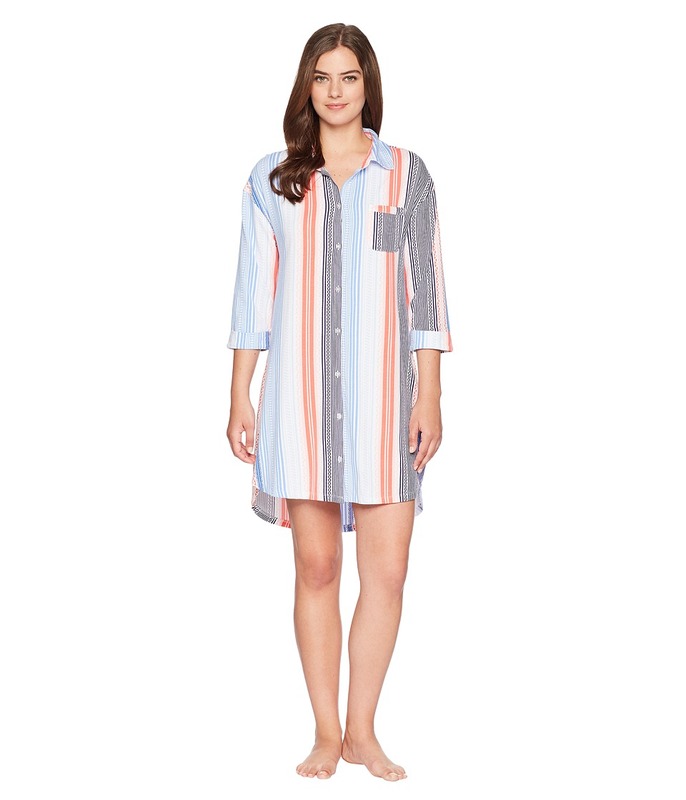 Pretty sleepshirt crafted in a soft and stretch jersey fabrication. 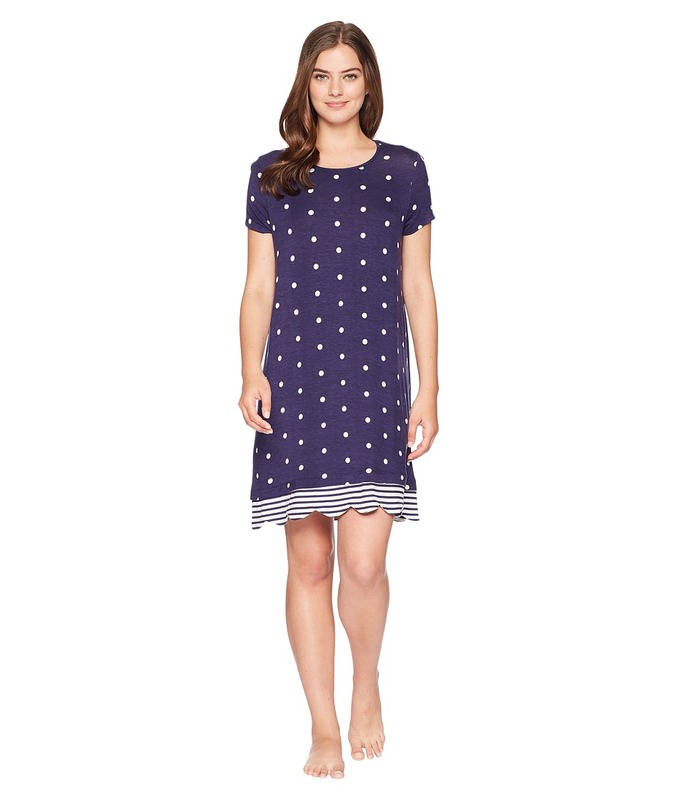 Pretty polka dots adorn the body while contrast stripes create an elevated look at the hemline. Round neckline. Short sleeves. Left chest pocket. Shirttail hemline with scalloped trim. 95 percent rayon, 5 percent spandex. Machine wash cold and tumble dry low. Imported. Measurements: Length: 37 in Product measurements were taken using size SM. Please note that measurements may vary by size. Comfortable sleepwear basics. Striped tee crafted in a soft jersey fabrication. Round neckline. Elbow length sleeves. Left chest pocket. Droptail hemline. 95 percent rayon, 5 percent spandex. Machine wash cold and tumble dry low. Imported. Measurements: Length: 30 in Product measurements were taken using size SM. Please note that measurements may vary by size. 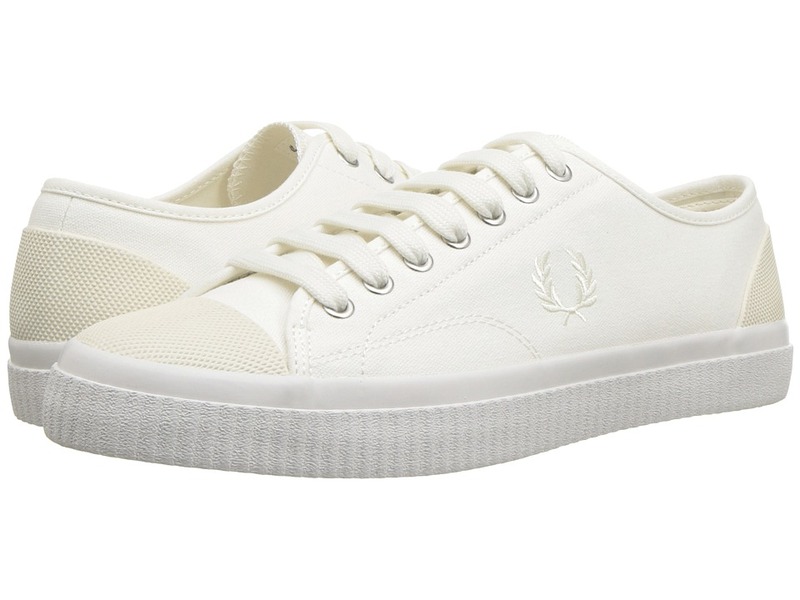 Get back-to-basics when you accentuate your minimalist look with the Fred Perry Hughes Canvas sneaker. Canvas upper material. Lace-up construction with metal eyelets. Round, cap toe. Tonal stitch detailing throughout. Signature logo accent accentuates side panel. Textured rubber toe and heel counter. Textile lining. Lightly padded, non-removable insole. Ribbed, rubber outsole. Imported. Measurements: Weight: 1 lb Product measurements were taken using size UK 10 (US Men~s 11), width D - Medium. Please note that measurements may vary by size. Weight of footwear is based on a single item, not a pair. 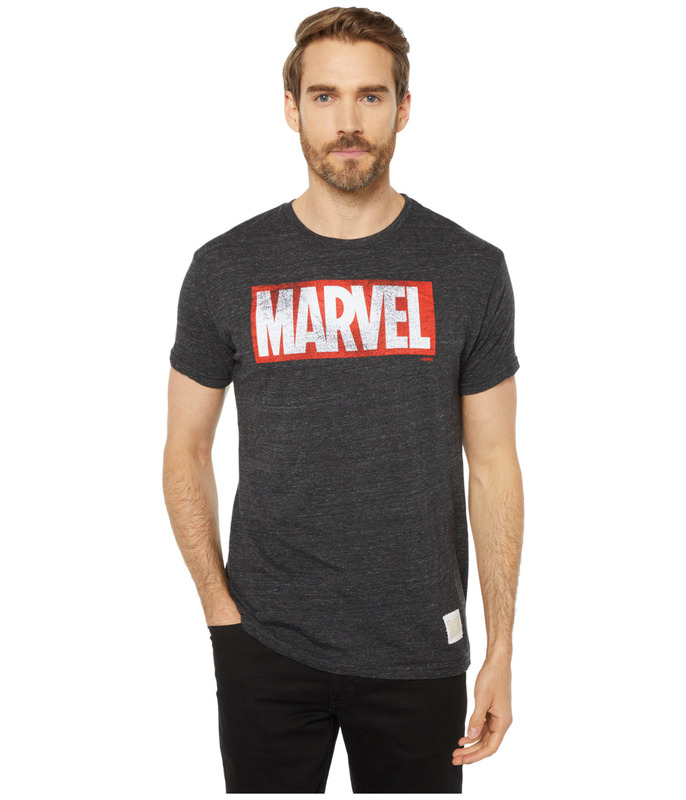 Trade in plain basics for this comic Original Retro Brand T-Shirt. Slim-fit tee is crafted from a soft, lightweight tri-blend jersey. Rib crew neck and short sleeves. Vintage-graphic print at front. Woven label patch at left hem. Straight hemline. 50 percent polyester, 38 percent cotton, 12 percent rayon. Machine wash, tumble dry. Made in the U.S.A. and Imported. Measurements: Length: 27 in Product measurements were taken using size MD. Please note that measurements may vary by size. 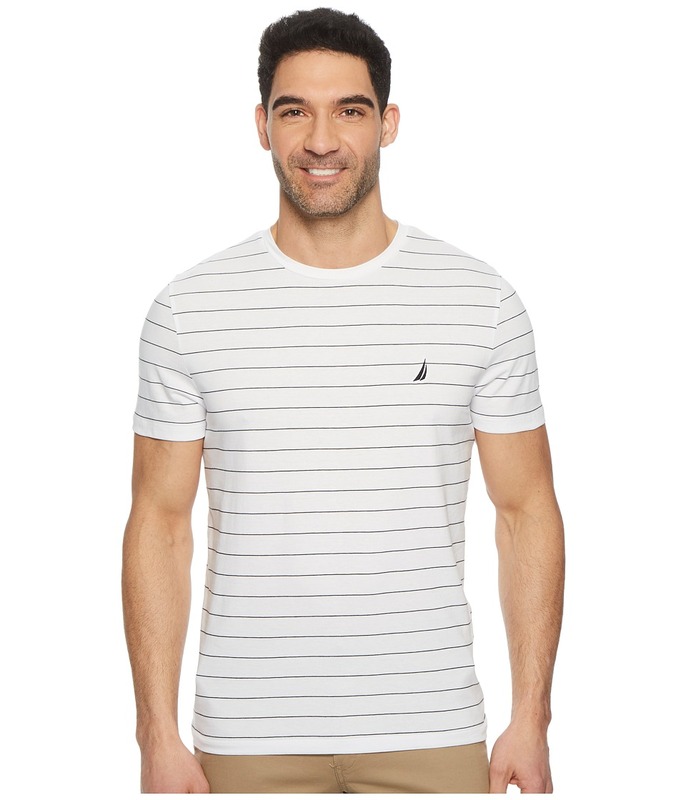 Trade in plain basics for this Nautica T-Shirt. Yarn-dyed stripes on a soft cotton fabrication. Classic fit. Crew neckline. Short sleeves. J-Class logo at the left chest. Brand tab at left hem. Straight hemline. 100 percent cotton. Machine wash, tumble dry. Imported. Measurements: Length: 29 in Product measurements were taken using size MD. Please note that measurements may vary by size. Take it back to the basics in the classically chic Bleu Rod Beattie Hipster w/ Gold Hardware. Bikini bottom in a textured pattern features gold-tone hardware. Low-rise waist. Moderate rear coverage. Bikini top not included. 92 percent nylon, 8 percent spandex. Hand wash, line dry. Imported. Measurements: Waist Measurement: 26 in Product measurements were taken using size 4. Please note that measurements may vary by size. If you~re not fully satisfied with your purchase, you are welcome to return any unworn and unwashed items with tags intact and original packaging included. Curl up on the couch in the cool, cuddly style of the Eberjey Gisele Basics Short PJ Set. Rounded notched collar. Short sleeves. Front button closure. Left chest patch pocket. Shorts feature an elastic waistband. Contrast piping throughout. 95 percent modal, 5 percent spandex. Hand wash cold, lay flat to dry. Imported. This item may ship with an attached security tag. Merchandise returned without the original security tag attached or a damaged tag may not qualify for a refund. Measurements: Length: 25 in Waist Measurement: 26 in Outseam: 9 in Inseam: 2 1 2 in Front Rise: 9 in Back Rise: 10 in Leg Opening: 12 in Product measurements were taken using size SM. Please note that measurements may vary by size. Curl up on the couch in the cool, cuddly style of the Eberjey Gisele Basics PJ Set. Rounded notched collar. Long sleeves. Front button closure. Left chest patch pocket. Pants feature an elastic waistband. Contrast piping throughout. 95 percent modal, 5 percent spandex. Hand wash cold, lay flat to dry. Imported. This item may ship with an attached security tag. Merchandise returned without the original security tag attached or a damaged tag may not qualify for a refund. Measurements: Length: 27 in Waist Measurement: 26 in Outseam: 39 in Inseam: 32 in Front Rise: 9 in Back Rise: 10 in Product measurements were taken using size SM. Please note that measurements may vary by size.